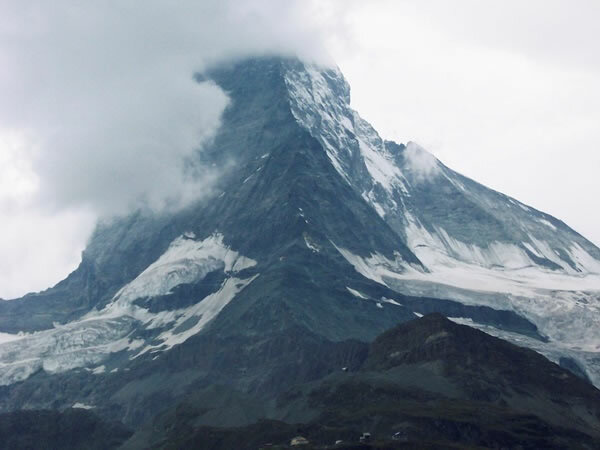 A telephoto of the lower slopes of the Matterhorn. While I’d caught the train to Rotenboden, Caroline and Eric had gone up to the Hörnli hut. It’s just visible at the foot of the mountain’s north-east ridge, which dominates the centre of this picture. However, the clouds covering the mountain were a foretaste of things to come – namely, it wasn’t possible to climb the mountain.